Tis the Season to Splurge! Based on data from the National Retail Federation (NRF) for Holiday 2016, holiday retail sales during November and December increased 4% in 2016 as compared to 2015. Consumers showed confidence during last year's holiday season, and seasonally adjusted spending was up in both December and November. While projections for the 2017 holiday season are still being finalized, the NRF expects strong sales heading into the Fall and holiday seasons after weaker-than-expected spending in the first quarter. 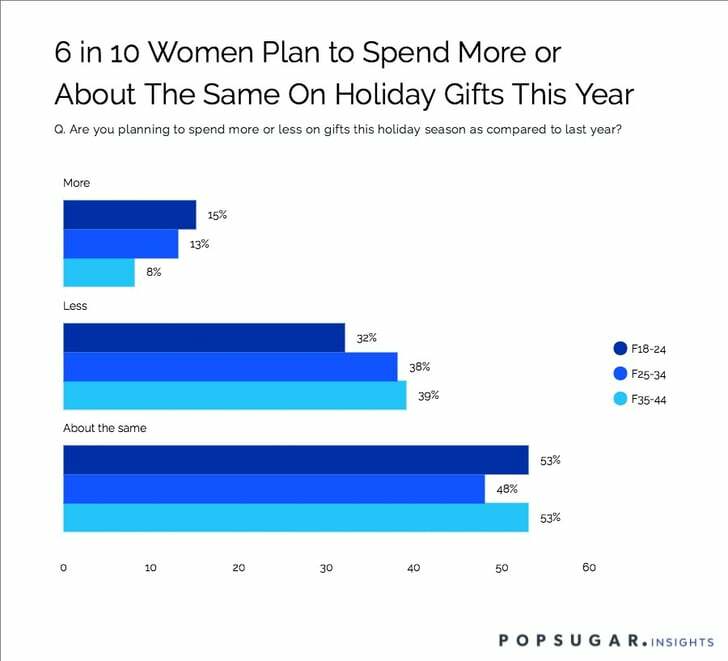 As part of the POPSUGAR Insights 2017 Holiday Report, we asked 3,000 US women to share their spending plans for the upcoming holiday season. Millennial women are feeling generous about this upcoming holiday season, with 64% planning to spend about the same or more on holiday gifts as they did last year. Trailing millennials, women between the ages of 18 and 24, are slightly more optimistic, with 68% planning to spend about the same or more on holiday gifts this year. Leading millennials, women between the ages of 25 and 34, are 9% less likely to spend about the same as or more (62%) than trailing millennials. One in three millennial women plans to spend more than $250 on holiday gifts and to stuff the stockings of friends and family this holiday season, with one in five planning to purchase over 15 gifts for their friends and family. This spending optimism bodes well for brands and retailers hoping to rebound from a slower start to the year with a flourish!